Home Affairs Minister pays unannounced visit at the Scottburgh Home Affairs - SABC News - Breaking news, special reports, world, business, sport coverage of all South African current events. Africa's news leader. Home Affairs Minister Dr Siyabonga Cwele with Nosipho Mkhupheka. 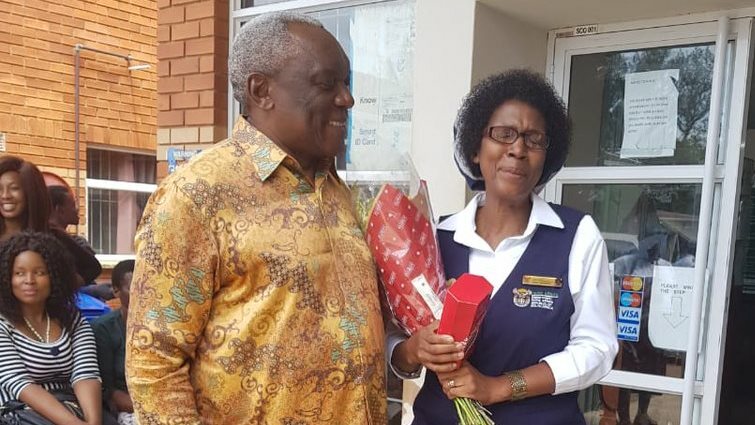 Home Affairs Minister Dr Siyabonga Cwele has on Monday paid an unannounced visit at the Scottburgh Home Affairs to visit Nosipho Mkhupheka and to monitor service delivery. This is after Mkhupheka was on spotlight over the weekend after social media user Marius Botha posted that he was moved by her dedication to her work as she assisted citizens beyond office hours. “Ms Mkhupheka is one best example of the thousands of Home Affairs officials who are dedicated to serve our people with a smile. When I arrived, the office was full and she was still assisting our citizens. The people who were there at the time I arrived said they appreciated her work,” says Cwele. Cwele says the Home Affairs Department has thousands of unsung heroes who quietly go about doing their work. He encouraged them to continue serving with integrity and pride. Mkhupheka has been a civil servant in KwaZulu-Natal for 30 years. She moved to her current position as a supervisor at the Scottburgh Home Affairs office in 2012. “When I leave my home each morning, I put myself in the shoes of the citizens who come to our office. I greet them when we open our office and regularly communicate with them should we have challenges”, says Mkhupheka. Mkhupheka has also thanked her team for the support. “What happened last week surprised me. I wasn’t expecting it. Usually, I would be working beyond office hours with Elvis Mavundla and Malcolm Ratube. They left shortly before the picture was taken and after we assessed how we were going to assist the citizens,” said Mkhupheka. Minister Cwele has been visiting front line service delivery offices throughout the country. “I support the Department’s efforts of finding lasting solutions to the connectivity challenges. I thank all those staff members who go beyond the call of duty to practice the principles of Batho Pele on a daily basis,” says Cwele. This entry was posted on 11 Feb 2019,05:56PM at 5:56 PM and is filed under South Africa. You can follow any responses to this entry through the RSS 2.0 feed. Both comments and pings are currently closed.